My name is Catherine Sanderson. Petite Anglaise was my online pseudonym from 2004 until 2009. For the first two years, I blogged anonymously about my life in France and parenting a bilingual child. Occasionally an anecdote would feature my (also anonymous) workplace, as scenery, if you will. It was the latter that landed me in hot water, costing me my job. A French employment tribunal ruled that I had been unlawfully dismissed and awarded me compensation, because when all was said and done, writing a post, say, about falling down the stairs in my unidentifiable office and snoring while I was out cold was embarrassing, in a Bridget Jones kind of way, but not in breach of any code of confidentiality. Whatever the rights or wrongs, getting fired was a thoroughly unpleasant experience, and if I could turn back the clock, the “working girl” category of this blog probably wouldn’t exist. A number of journalists were regular visitors to the blog, and the story of my sacking appeared first in the Daily Telegraph, then went out across the AFP wire, then travelled all around the world. Who knew it would be so newsworthy? This resulted in the loss of my anonymity (which I regret) and a bidding war among several publishers (somewhat surreal, to say the least). I pocketed a tidy sum (which I couldn’t help feeling I didn’t really deserve) and took some time out from office life to give writing for a living my best shot. 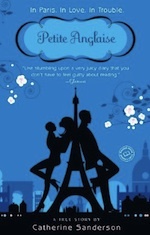 “Petite anglaise”, a memoir based on the experience of writing this blog, was published in several languages and countries around the world in 2008. I still get a warm feeling every time an email lands in my inbox from a stranger halfway around the world who enjoyed reading it. Sales were respectable enough for a first time author, hitherto unknown, but far beneath my publishers’ expectations. 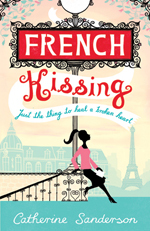 I also tried my hand at writing a novel, “French Kissing” (my title was actually “Rendez-vous”, the name of the fictional Meetic-like dating site at its core, but authors have less control than you’d imagine over details like covers and titles) which, let’s be honest, still borrowed heavily from real events and was populated with characters based on people I knew. The end of my writing experiment coincided with the birth of my second child, in 2009. I no longer felt comfortable writing about my own life or borrowing from the lives of my friends. With hindsight, personal blogging lost much of its attraction for me when I could no longer hide behind a pseudonym, and although after the ink was dry on the book deal I felt obligated to continue updating my blog until the books had made it onto the supermarket shelves, my heart was no longer in it. These days I have very little internet presence. But, having weighed up the pros and cons, I’ve decided to leave my blog online, intact, for posterity. Readers of my books rather like to be able to visit to sift through the original source material. And my daughter still gets a kick out of hearing the song she made up about splitting her lip just before her fourth birthday. Above all, if the story of how an anonymous blog once cost me my job is to hang around in the internet ether to haunt me for many years to come, I feel I shouldn’t allow only second-hand accounts tell my story. Jack was finally born at 41 weeks and 4 days on Monday 2 November, on the night of the full moon. His birth was spookily similar to Tadpole’s. I found myself in the same salle d’accouchement at the Maternité des Lilas where my daughter had been born six years earlier and, like his big sister, Jack wasn’t all that keen on coming out. As a result, my hoped-for natural birth was soon forgotten as I had to be hooked up to various drips, given an epidural and strapped to a monitor. Finally, at 7.03 pm, just as the midwife was paging the obstetrician and threatening me with forceps, I saw a head of dark hair emerging and the marathon was finally over (contractions had begun a full 24 hours earlier). I sobbed with relief afterwards and swore I would NEVER go through it all again. Eleven days later we are all well, blissfully happy and revelling in The Boy’s paternity leave. Jack would happily eat all day long, but he compensates by sleeping 4 or 5 hours in a row, twice a night. He pulls the most ridiculous faces when he’s trying to poo. The softest place in the whole world is the portion of his neck just below his little ears. I’m besotted with him, in short. We all are. I got an email from a reader the other day enquiring after my well-being and suddenly realised I hadn’t blogged in over a month. The truth of the matter is that I’m fine – indeed, we all are – but the inclination to blog, which has been on the wane for some time, seems to have finally left me, and, this time, I suspect it might be permanent. When Tadpole says something funny or disturbing – such as yesterday, when we were sharing a bath and she confessed she rather likes the taste of her own crottes de nez – I’m no longer overcome by an overwhelming desire to rush to my keyboard and share her words with the world at large. I tend to update my facebook status instead, and I find that eliciting a few brief responses from my friends usually satisfies any cravings I might have for a spot of banter or virtual interaction. For a long time I put this changed state of affairs down to the fact that I was writing for a living; I reasoned that it was normal, really, to want to do something other than write in my spare time. But I’ve been on hiatus, bookwise, since the springtime, and the desire to express myself in the form of lengthy blog posts online hasn’t miraculously returned, so it would seem that wasn’t the real explanation, after all. I read an article a month or so ago about Liz Jones, a newspaper columnist who has made a living out of sharing every aspect of her personal life, showing little or no regard for the feelings or right to privacy of the partners/lovers/neighbours that she uses for material. It left a nasty taste in my mouth. Personal blogging was something I felt the need to do during a short, pivotal period of my life but, as I hope I demonstrated in my memoir, I realised, with hindsight, that particular path was strewn with landmines. I learnt some valuable lessons from the experience and will always be grateful for the doors which opened as a result. But now I’ve moved on. When my publisher asked me to pen a host of first person articles to coincide with the launch of ‘French Kissing’, I wasn’t at all keen. None of the pitches I sent, somewhat reluctantly, to various newspapers and magazines were actually commissioned, and while I’m sure this didn’t do sales of the book any good, I felt nothing but relief. By choosing to write a novel, I’d consciously taken a step away from tell-all, first person writing. Admittedly, some of the subject matter might have seemed familiar to regular blog readers – single motherhood, expat life in Paris, dabbling with online dating – but every scene and every last shred of dialogue was invented. I found it more enjoyable, making use of some of my experiences in a fictional context, once removed from my own life. Which is why plugging the novel by writing no-holds-barred pieces about my personal life would have felt like a leap backwards. So. Let’s make this official. I’ll post updates here if I have any exciting book-related news – such as the French translation of ‘petite’, which will finally be published in my adoptive country on November 4th – and I’m sure I’ll drop by to upload a photo of the new baby, a month (or less) from now. I’m still on facebook – both in a personal capacity, and as an author – and am in the process of reviving my long neglected twitter account. But, as far as personal blogging is concerned, I’ve turned the page. And it feels good. …we had a fantastic time in Turkey. The landscape was beautiful. The beaches were largely unspoilt (thanks to the presence of loggerhead turtles who nest in the area and prevent any sort of permanent construction.) The ruins made this ‘old stones’ lover very happy indeed. The food was yummy (although, predictably, Tadpole lived on a diet of cucumber, tomato and chips). The people were über friendly, especially to Tadpole, who now boasts a large collection of complimentary lucky eye charm beads and bracelets, and I was forced to coo over at least twenty pictures of newborn babies belonging to various waiters, taxi drivers and hotel owners. Tadpole learnt how to snorkel, and the way her face mask compressed her mouth and nose, resulting in a Meg Ryan style trout pout provided a constant source of amusement. And the dance she performs when wearing the shocking pink, jangly coin-infested costume I bought her from a bazaar in Istanbul is truly a thing to behold. But the funniest moment, in my opinion, was when we returned home to Paris and I handed Tadpole my phone to call her daddy, who has now whisked her away on yet another holiday. Of all the things we’d seen and done, what did she tell him about? The turtles? The snorkelling? Her new costume?